The aliens are coming. You’ve seen all of the movies. You know the deal. You can try to deny it all that you like, but they’re coming. It might not be today. It might not be tomorrow, but eventually, they’ll come in full force to take over our planet. Our only hope of survival is to fight! You need to start practicing now! Unfortunately, it wouldn’t be safe to practice with real laser guns. You could end up blowing up the whole neighborhood! We have something that’s much safer to use while you train for the next alien invasion, this Space Gun accessory. This toy space gun is inspired by all of the weaponry seen in science fiction movies. It has a comfortable grip with plenty of molded details to give a true space-age look. Pull the trigger and it even makes sound effects! 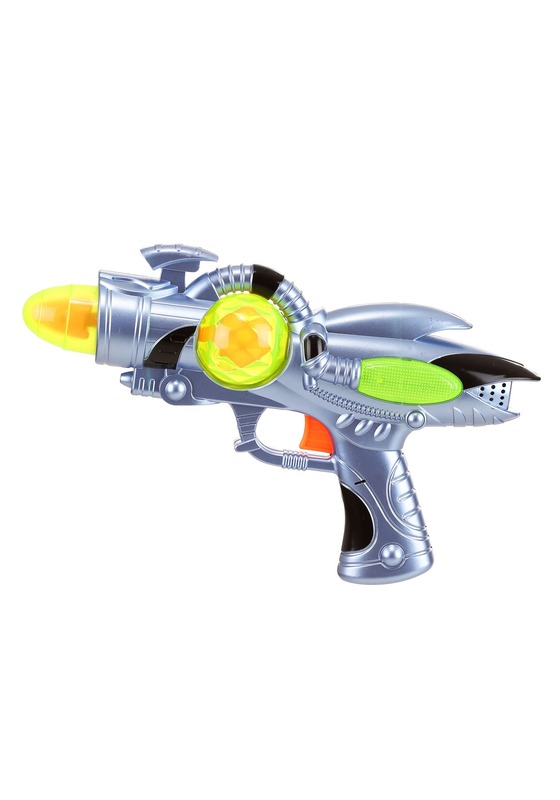 With this space gun in your hands, you can somersault around the neighborhood, blasting imaginary aliens in your backyard. When the neighbors ask you what you’re doing, just tell them that you’re training for the next alien invasion… or you could just give it to your child, so they can zap a few pretend aliens! So worth the money - can't believe how much fun it was to play with - and I"m an adult, sort of.